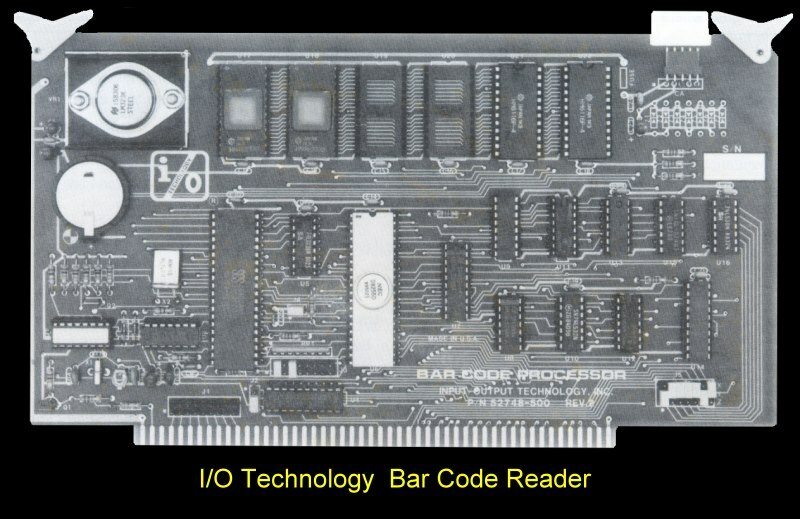 This was a highly specilized board to utilize a supermarket type bar code reader. Address Decode circuitry allows for the selection of 2 out-of 256 possible address locations using 8-bit addressing and for 2 out of 65,536 possible address locations using 16-bit addressing. Maximum characters that can be read or printed in one label: 42 for most codes (includes start, stop and checksum characters in some codes). Maximum data characters for Bytewriter code is 62. The 24 hour clock could be set and read on request. The elapsed time counter could be started and read without affecting clock time. Elapsed time started at 00:00:00 at power on. The brochure for this board can be obtained here.